A 23-year-old man who’s on parole for a local robbery has been charged with battering and resisting police officers who responded to a call of a man with a gun inside The Crib youth shelter in Boystown. A shelter staff member called 911 at 10:15 p.m. on February 7 to report seeing a man with a gun in the basement of Lakeview Lutheran Church, 835 West Addison, where the shelter operates, according to city records. When cops arrived, they were confronted by Darrien Lampkin, who proceeded to attack one of the officers. Police deployed pepper spray and detained Lampkin, their report said. ...at 12:58 [in] the 3500 block of N. Fremont Street, a witness reported seeing two offenders...beating a man on the ground. The caller said he could hear the victim screaming. The first officer on scene caught up with and detained at least one offender on Cornelia Avenue, a short distance west of Halsted Street. Another suspect was taken into custody after officers apparently spotted him outside of Berlin nightclub, 954 W. Belmont. A Samsung Galaxy cell phone was taken in the strong arm robbery, which is recorded under case #HW411123. Lampkin was handed two five-year sentences to be served concurrently and was released on parole last September. The state revoked his parole last week and sent him back to Stateville Correctional Center to serve out the balance of his original sentence. 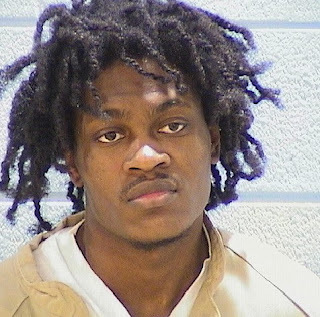 A Cook County grand jury this week returned a true bill of three counts of aggravated battery of a police officer and one count of resisting police against Lampkin in connection with the February 7 incident. In October, CWB Chicago reported that one of three men accused of beating and robbing a 64-year-old retiree in Boystown last autumn posted a video that showed him taking shelter at The Crib. Like Lampkin, the man in our October report—Keyruni Buford—was also on parole for robbing another victim in Boystown at the time of his arrest last year. And, like Lampkin, Buford’s 2013 robbery took place about a block from The Crib’s front door. Buford’s parole was revoked last month, and he was returned to the Lawrence Correctional Center to serve the remainder of his original six-year sentence, according to state records.